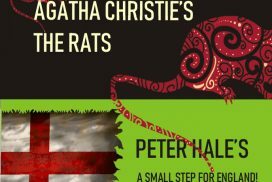 Peter Hale’s A Small Step for England! The Rats Copyright © 1961 Agatha Christie Limited. All rights reserved. AGATHA CHRISTIE is a registered trademark of Agatha Christie Limited in the UK and elsewhere. All rights reserved. Irrational Theatre’s productions are directed and designed by St Albans-based Paula Chitty with a mix of local and London cast to bring you fascinating productions of entertaining plays and opera.